However, a significant number of laggards are turning their backs on DevOps. While 60% of respondents in the retail and IT Services industries are already using DevOps, less than 40% of those in the government/education and not-for-profit sectors have adopted it – and over a third (36%) say they have no plans to implement DevOps within the next two years. The research also pinpoints the benefits that DevOps is delivering. 63% of those surveyed feel that DevOps has a positive impact on regulatory and compliance requirements – a vital issue given the forthcoming EU General Data Protection Regulation (GDPR), with its May 25 2018 deadline. This rises to 69% among those who have already adopted DevOps – showing that the further down the implementation path organizations are, the greater the compliance benefits. Databases are increasingly central to business operations, with over a third (35%) of organizations deploying database changes either daily or more than once a week. This is reflected in the key benefits that respondents see from adopting database DevOps – 28% say that increasing speed of delivery is the biggest advantage, up from 26% in 2017, followed by freeing up developers and allowing them to handle more added value work. This is cited by 23% of people in 2018, a big jump from last year’s figure of 17%. Skills shortages are the biggest challenge to successfully adopting DevOps, identified by 24% of respondents, followed by disruption to existing workflows and the business (20%). The survey found that DevOps is increasingly seen as a business priority – just 12% cite lack of awareness of the business benefits as the main obstacle to adoption, a fall of a third from 17% in 2017. However, 40% of the laggards who have no plans to adopt DevOps blame a lack of awareness of the business benefits as their main challenge, demonstrating a need to educate management on the advantages that DevOps brings. The survey also found that traditional barriers between developers and database administrators (DBAs) are breaking down, a key cultural requirement for DevOps to succeed. 58% of organizations say that collaboration between these teams is either good or great, rising to 68% amongst those who have already adopted DevOps. Over three quarters (76%) of teams have developers who are responsible for both database and application development, showing an increasingly collaborative approach. 75% say developers typically build database deployment scripts, with this group responsible for deploying database changes to production in 47% of organizations. While teams are working more closely together, the survey found they are not yet adopting common practices. For example, 81% of organizations use version control in application development, but just 53% within database development. A similar gap exists in other areas, such as continuous integration, with 40% using it within application development and 21% in the database. The key challenges to integrating the database into DevOps remain similar to 2017, with nearly a third (31%) citing synchronizing application and database changes as the biggest issue, followed by overcoming different development approaches (23%). Demonstrating the close relationship between databases and development, two thirds (67%) use production data in their development, test or QA environments. This use of ‘real’ data helps speed development, but also brings compliance and privacy concerns. 57% of respondents recognize that data will need to be modified or masked before being used in non-production environments. The 2018 State of Database DevOps Survey was based on a survey of 700 SQL Server professionals from around the world. 57% were based in North America, with 27% in Europe. In terms of size, there was an equal split between organizations employing up to/over 500 staff, with 14% of respondents working for companies with 10,000+ employees. 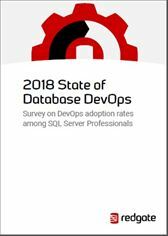 To download the full 2018 State of Database DevOps Survey please visit Redgate online.